I was intrigued by Neumann & Fahmy’s framing analysis of the visual coverage of the Sri Lankan Civil War (2012). They explore news photographs and their framing as part of either war or peace journalism, and use their findings as a platform to discuss the gatekeeping role these images play in how we view global events. The study brought to mind a visual framing issue that I recently explored in depth. In the non-profit world, well-written and well-designed fundraising appeals are critical to fundraising success. Several recent studies have tackled the issue of visual images in fundraising appeals and how their framing as either happy or sad influences donor intention. In a 2009 study, Small and Verrochi found that sad images generate the most sympathy, and also the most donations. A 2010 study by Chang and Lee agreed and went even further to find that the framing of the text of an appeal must match the included images to be most effective. In other words, a sad image with a happy, upbeat textual message won’t work as well as an appeal featuring either all sad elements or all happy elements. In their discussion of visual framing of news events, Neumann and Fahmy discuss the overwhelming “power of photographs” to determine how a news event is thought of by the public. 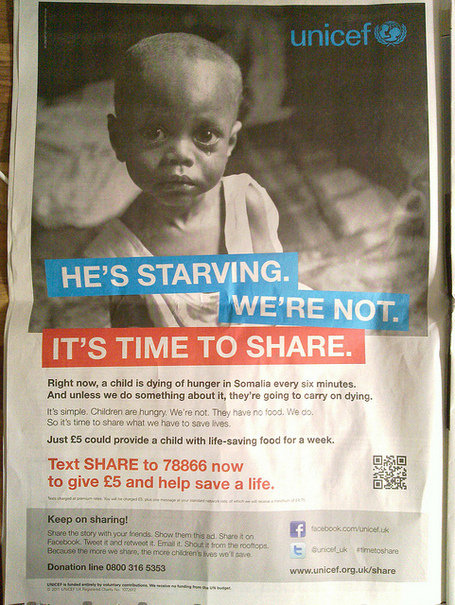 Images are just as potent when it comes to fundraising appeals: they speak volumes. Is it ever effective to include multiple opposing frames in a single communications piece? Excellent point Kara! Indeed, thinking about these frames from a fundraising perspective gives huge credence to your message and power to your appeal. It’s why it’s so important to know your audience as well! If you know what motivates them, your targeted efforts will be much more effective.